This may just be what I need to get me to dust off the kokles on my shelf. The Rīga-based culture management center Lauska has released a book by folklore expert Valdis Muktupāvels, Kokles un koklēšana Latvijā, that tells the stringed instrument’s history and teaches the reader how to play it. 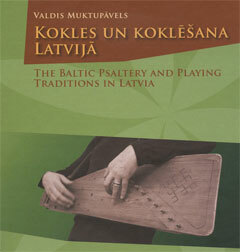 The book comes with a compact disc, “Koklētprieks – skaņojumi, vingrinājumi, repertuārs,” that helps the listener tune the instrument and offers help in learning to play the kokles. Together, the book and the CD are designed to help teachers, folklore ensembles and those who wish to learn on their own, Lauska announced on its Web site. Until now, Lauska claims, a book about the kokles and systematic instruction in how to play it has not been available—despite the instrument being an icon of Latvian culture. However, readers in the diaspora may be familiar with Koklēšana and Koklēšana II by Andrejs Jansons, published in 1965 and 1977, which helped spread appreciation for the instrument in North America. Muktupāvels is an expert kokles player and has a doctorate in ethnomusicology. He leads the folklore and ethnology department at the University of Latvia. The book is in Latvian with English translation by Amanda Jātniece, who is a contributing editor for Latvians Online. Kokles un koklēšana Latvijā, by Valdis Muktupāvels, offers instruction in how to play the instrument. Hello, My name is Sarah Treibergs,(husband Juris Treibergs). We just purchased a kokle for our daughter, Kira for her 30th BD and I would like to purchase this book for her. She is a cellist, so is able to read music. Please send me an email with instructions as to how to purchase this book &CD.